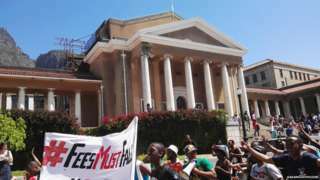 Protests over fee increases have forced the suspension of teaching at three of South Africa's top universities. The three universities affected by this latest developments are the Johannesburg's Wits University, universities of Rhodes and Cape Town (UCT). Black students are of the views that the institutions' high fees are now preventing them from getting good education. And they lamented that the loans and scholarships that suppose to help them are difficult to secure. Meanwhile, UCT which is the most expensive university in South Africa has secured an order from the High Court in Cape Town to "prevent protesters from interfering with university operations", which comes into force at 07:00 local time (05:00 GMT) on Tuesday. The order authorises the police to enforce its terms, which include a ban on barricading entrances and occupying buildings on the the university campus. Is it right for the High Court to grant UCT such order?